Mount Thielsen is about 30 miles north of Crater Lake via the Pacific Crest Trail and this was our next challenge due to possible snow. I had been watching satellite snow data and could see the Mount Thielsen area had late snow this year. I’ve noticed that satellite snow data, while mostly accurate, tends to underestimate the amount of snow or maybe it just doesn’t show smaller (1/4 or 1/2 mile) patches of snow that can remain on the ground for several weeks after the satellite images show all the snow gone. 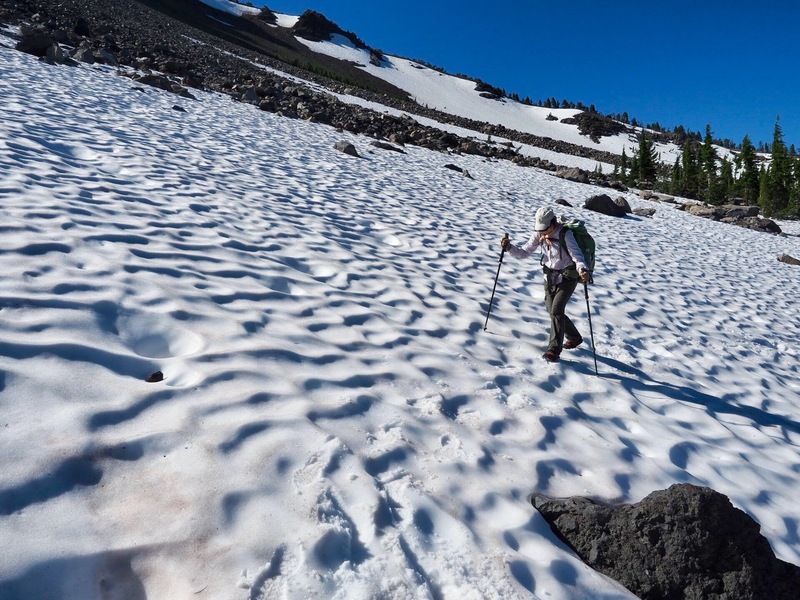 Packing for our hike in the 100 degree heat of Medford, OR a few weeks ago, snow seemed unlikely and we didn’t pack any snow gear (ice axes, crampons, etc.). So, off we go to the mountain. After all, the worst thing would be having to turn around if the snow was bad. Mount Thielsen turned out to be a wonderful section of trail. We camped a few miles before snow started. The next morning we got a late start to let the sun soften any icy snow and off we went. There was quite a bit of snow, but it was mostly patchy. It probably covered 30-40% of the PCT from around miles 1849 – 1860. The north side of Mount Thielsen did have several large snow patches and a couple of them were steep around miles 1851.4, 1852.3 and 1853.6. Thielsen Creek was still frozen over, but walking downhill about 300 yards we found water in a thawed spot in the snow. Surprisingly, we had the mountain almost all to ourselves. A large group of hikers departed Crater Lake about the same time we did, but we only saw three other hikers that day. Our group of three felt it was the best day yet on the trail.